So you would think that a person who owns her own karaoke machine would have sang karaoke outside of her home at least once. You would be wrong, though. At least in my case. I've come very close many times. I've just never been brave enough. 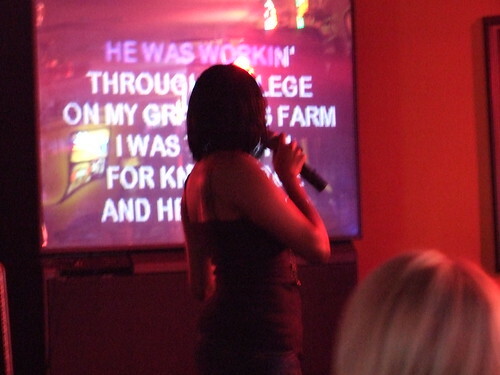 Once, when I was back home, my parents and I were hanging out at a bar when the karaoke guy came in. I was looking through one of his books to find a song to sing and he kept hollering at me to see if I'd chosen yet. Of course, I was taking forever. Those books are huge, though! And I love a lot of songs, so it was hard to choose. Oh you know you would totally sing along! When the Karaoke Master looked my way, I was all prepared to go up and perform. But when he asked me if I was ready, he was really mean about it. I know, you think I was just looking for an excuse. But you can ask my parents! He was really really mean about it! So he scared me away and I've gone live performanceless. My manager, Angela, recently got a promotion. Unfortunately, that means she's going to Topeka. So we decided to have a going away party for her. Angela begged everyone to sing something for her. Tiffany went first and sang "Strawberry Wine." Yuck. A few other, really good people performed. Eventually I mustered up some guts (and some drinks) and threw my name into the hat. For Angela. The whole time grumbling "She'd better appreciate this!"